Jack Newell, a 31-year-old Old Town resident, is in the midst of filming a documentary in Haiti titled "How to Build a School in Haiti," which was inspired by an National Public Radio story. OLD TOWN — Chicago filmmaker Jack C. Newell's journey started in spring 2010 when he heard an NPR Planet Money story featuring the small Haitian town of Villard. There were two follow-up pieces, one on a school principal's failed attempt to build a new school with donations received from listeners and a second in April 2011 about a 65-year-old Colorado retiree who decided to head to Haiti and make the project happen. Newell heard that third broadcast while driving in his car and raced home. He emailed Tim Myers, the former construction worker who took things into his own hands, and told him he wanted to make a documentary about his efforts. Newell, a 31-year-old Old Town resident, has spent the past 2-1/2 years traveling back and forth between Chicago and Villard filming the progress of the construction of the school, called The Villard School. 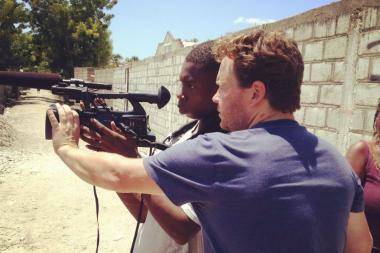 On Wednesday Newell returned to Haiti to prepare to film the most anticipated scene, the school's grand opening. "Once you go [to Haiti] it changes everything," he said. "It's life-changing just to see how good we have it here, but also how happy people are there." The film, "How to Build a School in Haiti," documents the construction of the school through its completion, and will eventually include a look at the progress of the school and community a year after its completion. The students who will eventually take classes in the school are now studying in a cramped church and in corrugated steel sheds next to the latrine behind the church. "It is just hot and smells like feces back there. It is pretty offensive," Newell said. It's the Columbia College Chicago graduate's first full-length documentary. "It's hard down there" in Haiti, he said. "It's slower. There's corruption. There's nepotism. The way business gets done down there is different." Newell raised $8,000 through a Kickstarter campaign in March 2012 to help fund trips to and from the country, and launched a second Kickstarter campaign Wednesday. He hopes to raise $15,000 to pay for additional trips, pay translators, hire transcribers and cover post-production costs. He is hoping to release the movie in 2016 or 2017. The filmmaker is also working on a romantic comedy titled "Open Tables," which was filmed in some of the city's hottest restaurants. "Close Quarters," his first movie, was set in a Lakeview coffee shop. Moviemaking became Newell's full-time job 1-1/2 years ago, forcing him out of his teaching position at Columbia College. "We've been at it for over two years and we are just trying to finish strong and get the film done," he said.